To celebrate the 10 year anniversary of the “Electronical” DVD, Odyssey have given it a re-up for your viewing pleasure! Like they say, time flies when you’re having fun! Odyssey released their “Electronical” DVD 10 years ago today and even after all these years it’s a complete banger! Hit play to check out this video featuring Jim Cielencki, Jimmy Levan, Matt Beringer, Aaron Ross, Taj Mihelich, Chase Hawk, KC Badger, Adam Banton, Danny Hickerson, Mike Aitken, Gary Young and many more (Talk about a completely legendary line up of riders) going to work on street spots, skateparks, trails and more! One fun fact about this video that always blows our minds is that this was the first full 1080P DVD that came out. Watching it for the first time made everyone’s minds melt since it was some of the highest quality BMX footage many had seen. Even though this version isn’t as high definition as the original DVD, it’s amazing.. Will Stroud did an amazing job on the filming and editing for this one! Today marks the 10 year anniversary of the Electronical video premiere. Time flies! We have re-upped the video in case you have never seen it. The latest Strays photo flipbook from Ben Austin has arrived! It’s time for another round of Strays from Ben Austin! This time around he has recruited photographers Ryan Ogawa and Scott Marceau as contributors! As always, this flipbook contains a bunch of great riding related photos that didn’t have a home, until now! You can find street, skateparks and trails in this one, so give it a quick look! Kink have uploaded the first mix section from their “Intervention” BMX video online for your viewing pleasure. This section is packed full of heat from Travis Hughes, Jacob Cable, Ben Basford, Jay Roe, James Steele, Kc Badger, Tanner Jensen, Alexander Shurva, Josh Pascasio, Connor Lodes and Kristaps Reimanis! Get on that play button! Want to see the whole video? Watch the entire “Intervention” video here. A little while back, the Team Shralp crew celebrated their 10 year anniversary, so Dean Dickinson put together a two day bash where guys like Lil’ Jon, KC Badger and more threw down and just had a good time on their bikes. Check out what went down in this video that Logan Reynolds put together. ‘MERICA! Our friend, Henry White, hit us up with an interview he recently did with KC Badger talking about BMX and his other hobbies like fly fishing and how it effected the way he looks at things! It’s a great read and can be checked out RIGHT HERE! Kink just dropped this new one from a trip Chad Osburn took from Texas to California featuring Chad, KC Badger, Darryl Tocco, Jay Roe, Albert Mercado, Connor Lodes, Ashley Charles and more riding parks, street spots and more they crossed along the way! “Early January 2015, Chad Osburn hit the road from Dallas, TX to Fresno, CA with Darryl Tocco along to capture it all. Hanging and riding in Phoenix, San Diego, and Fresno, with some of the Kink squad, and other friends meeting up a long the way! 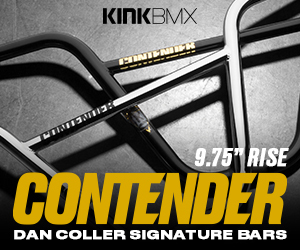 Kink has released the next installment of their “Off The Clock” ad series. This time around we’ve got a behind the scenes look at how they shot KC Badger’s ad while he spends some time fishing. After you check out the video, click here to see more photos and info! Definitely interesting to see what really goes into something like a single photo for an ad. Here’s a super chill new edit of KC Badger getting some riding and fly fishing time in for this new Kink edit. You also get a closer look at his current setup too which is looking real good. “KC Badger does some fishing and riding in Arizona, all while giving a smooth run down of his current bike set up. Classic KC Badger footage never gets old!